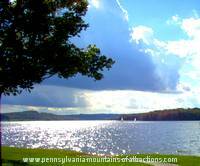 Treat your family to Mountains Days at Prince Gallitzin State Park. It's an old fashioned festival complete with helicopter rides, hayrides, mountain pies and bonfires. This popular Pennsylvania event was discontinued a few years back but started back up again after popular demand. This is the 4th year since coming back to Prince Gallitzin State Park. You'll be amazed at all the businesses that are taking part in Mountain Days. Every business in and around the Glendale Lake area has something special for visitors to enjoy. Glendale Lake alone with it spectacular view, marina and nooks and crannies to explore can keep you entertained for a day let alone all the activities when Mountain Days roll around. Join the fun at Muskrat Beach and take a helicopter ride and see Glendale Lake like you've never seen it before. Go on a hayride and Craft Vendor at both the Muskrat Beach and the Main Beach at Prince Gallitzin State Park. Go Kayaking, take a nature hike, or just relax and sit around the lake. There is just so much going on during Mountain Days that you'll have to go and experience it all, after all, you have three days. Why don't you just spend all three days at the beautiful Prince Gallitzin State Park Camp Grounds? This is a win win opportunity to enjoy one the most beautiful PA State Parks and have three full days of Mountains Days celebrations. The village of Fallingtimber and Coalport come alive with excitement during this once a year event. No matter where you stop on either side of Glendale Lake you'll notice some kind of celebration. Sir Barney's and Noel's Drive -in and The Pirate's Cove will be having outdoor concerts. The Pirate's Cove will be features guests like Sponge Bob posing for pictures while they fire up the BBQ and serving crabby patties. There's going to be a bonfire at the Anchor Inn, serving mountain pies and hot dogs. They're having an outside concert too! Uncle Phil's General Store will have chainsaw carvers and a Kid's Fest. Plus you'll see a fireworks display if you stay late! It's all about old-fashioned Pennsylvania Mountain fun and it's all centered around beautiful Glendale Lake. Experience Mountain Days for yourself and you'll see why it was brought back after popular demand.